It is known fact that India is poor country & Indian also believes it. As per data India is world’s third poor country. It is estimated in world bank report of 2010 that 32.7% of Indian fall below international poverty line of 1.25 US$ per day. 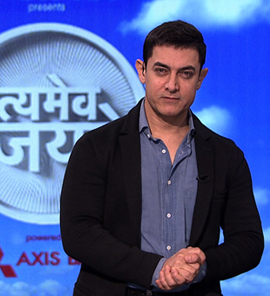 So asking question that “How rich is every Indian” itself is wrong, but in today’s episode of Satyamev Jayate Amair Khan has shown that although it is said India is poor, our country is rich & abundant in terms of natural resources. The government owns all natural resources such as land, forests and mines, minerals, hydrocarbon, etc. Along with this, the government owns physical and capital assets in the country’s industrial and services sector. As India is democratic country people are supreme & all these resource must contain collective ownership of people (citizen of India). It is very difficult to estimate value of all natural and physical resources owned by government but effort is made by Centre for Budget and Governance Accountability on request by Aamir Khan to find estimated value of all these government-owned resources in India to find per capita value of these resources. As per estimate approximate value of only the stocks of hydrocarbons and part of the country’s mineral resources is Rs 5 thousand lakh crores. If we divided this amount in to the population of the country, which is approximately 120 Crore, each Indian is worth more than Rs 40 lakh. This amount contains only estimation of mineral and natural resources. As per Aamir Khan If we include other resources like land, public sector companies, spectrum and all other things than it can be said that every Indian is crorepati. So if every Indian is crorepati why India is poor country? India is poor because of poor governance, corruption & scams. Scams and corruption are now part of our life. Our hard earned money is getting robbed by politicians and government every day. Many of you might not get agreed that how it is our money. Let me remind you that we pay money to government in terms of tax for infrastructure building, education etc. You might think that I am not paying any Income tax because of low income, but you will be surprise to notice that we pay 20 Types of Taxes in India. In our daily life from morning to evening we use multiple things which we have purchased from market. Once we purchase anything from market we have to pay tax (VAT). Remember apart from Income tax (direct tax) we pay lot of Indirect tax to government. It is estimated that Indirect tax income is more comparing to direct tax in India. We have seen numerous cases of corruption & scam, both, on national level and on state level from independence. 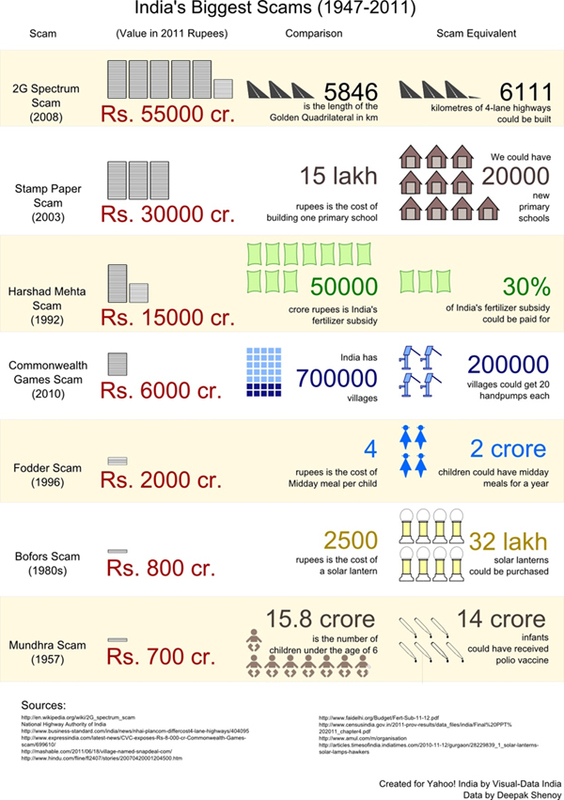 The CWG scam, Adarsh society scam, Telgi scam, Satyam Scam, Fodder scam (Chara Ghotala) 2G Scam & Coalgate scam are some of the well known scams. Scam is nothing but looting our own hard earned money. All these scam happens because corrupt politician & corrupt person works for personal interest and not for nation. We are here with all big scams details showing the amount which lost by the nation and because of these scams India is poor country of poor people. India is poor country because of Indian only. We Indian are not ready to change we have accepted corruption and scam as part of our life. We just don’t want to do anything about it. My dear friend’s time has come to save India from scam & corruption; we will have to do something because the line has been crossed. It’s now or never. I must say JAGO INDIAN JAGO. Do something to make India Rich. 40 lakh asset is very slightest value. have you considered about generation yet to come in future? and moreover value of asset were imaginary and and real value if you sell it off at once will be very less. amir khan argument is wrong. Good article Raviraj. Good thoughts, however I would have been excited if you would have given some tips on how an Indian can become rich. Such suggestions could benefit all of us. This post is written by Shitanshu as guest blogger. Well I think whole idea behind this post is to fight against corruption and scams happening in India. If Indian wants to be rich they have to make India rich. Few suggested step would be. (1) Remove/Avoid Black Money Transaction. (2) Expose Corruption and Penalize corrupt people. (3) Expose and Bring back Black money to India. (4) If any scam is exposed & proved all people involved in this scam has to pay back money back to government. By this way country can be rich. As per me this will cause reduction in Tax and Inflation. Removal of corruption and reduction in tax and inflation means rich and happy India. But how much additional investment would we need to get such an output ? Now , all that we need to realize our underground resources is a ” Magic Wand ” that would convert this Black Money into White Money ! And enable people to do so legally ! My suggested Magic Wand would eliminate poverty – something which Congress Governments have been trying to do for the past 60 years !